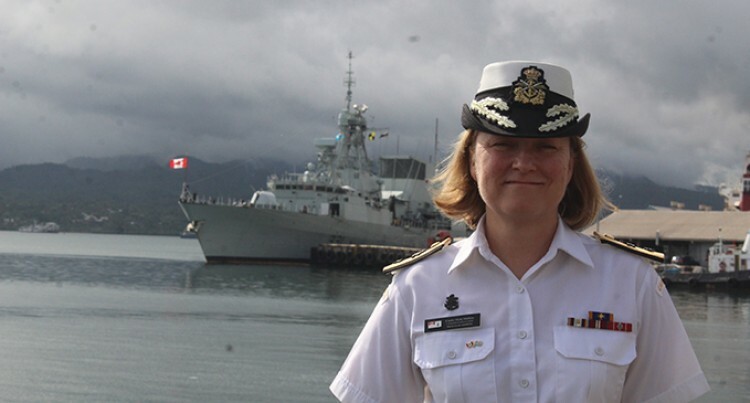 The Commander of Canada’s Naval Reserves, Commodore Marta Mulkins, has applauded the recent recruitment of the first group of women in the Republic of Fiji Military Forces naval division. She is also looking forward to meeting the new female sailors. “I heard the fantastic news about women now in the Fijian Navy. I personally believe that the naval service is a great career, great professional development in their lives, they will have the chance to meet their potential, so it’s a great step that Fiji has taken to make sure that women have this opportunity,” she said. Commodore Mulkins joined the Naval Reserves in 1985 and now holds one of the highest ranks. She was the first woman to command a warship in the Royal Canadian Navy. She commands 24 naval reserve units and its 3200 personnel located across Canada. Women make up 20 per cent of the regular force in the Royal Canadian Navy while there are 30 per cent of women in the reserves. This is Commodore Mulkins first visit to the country. Her visit coincides with the arrival of the HMCS Vancouver at the Suva port yesterday. Close to 100 personnel from Canada’s Naval Security Team (NST) are based at the Togalevu naval base. They had arrived more than a week ago aboard a Royal Canadian Air Force. Commodore Mulkins said they were involved in mutual capacity building with the Fiji Navy. “We will be working with them over the next few days on specific lines of activities, force protection tactics, gender interaction, casualty management types of subjects,” she said.